How May Oral-Tracheal Intubation Be Improved? How do some organizations succeed in performing intrinsically hazardous work at an intense pace with ultra-low rates of failure? And what lessons might anesthesiologists and their partners in perioperative health care learn about high reliability from such successful organizations? These were the fundamental topics of the APSF Board of Directors Workshop held on Friday October 10, 2003, at the ASA Meeting in San Francisco. Joining members of the Board of Directors were invited representatives of the American College of Surgeons (Dr. Thomas Russell, Executive Director), the Association of Peri-Operative Registered Nurses (Mr. Thomas Cooper, Executive Director), and the American Society of Post-Anesthesia Nurses (Denise O’Brien, BSN, RN). Also present were academic and private practice anesthesiologists from around the nation. HRO Brainstorming session results in one of several work product organizational charts. 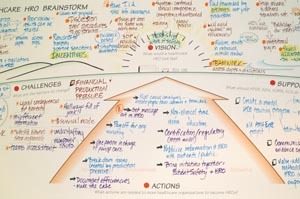 Lay out possible programs that APSF could undertake to assist institutions and health care systems to achieve HRO status. What is a perioperative HRO? What would it look like in practice? What steps would perioperative health care organizations need to take to achieve HRO status? What are the obstacles that have kept and could keep perioperative institutions from becoming high reliability settings? What can the APSF do via projects or programs to help anesthesiologists and their professional colleagues lead institutions toward achieving HRO status? This presentation was also accompanied by a draft document outlining a “straw man” example describing some details of a hypothetical high reliability cardiac surgery work system. In the third part of the workshop, led by APSF Executive Vice President Jeffrey Cooper, the groups worked as a whole to synthesize the common and key elements of the breakout sessions. Vision: What are characteristics of a Perioperative HRO? Ongoing audits of adoption of best practices. Develop an entity to promote HRO principles and processes. Challenges: What have been and are the barriers to change? 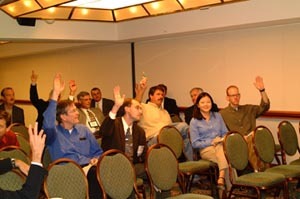 Participants at 2003 HRO Retreat show their enthusiasm during one of the breakout sessions. APSF Programs: What can the APSF do to help others achieve HRO status? A caution was raised that the language of HROs is tenuous. It would be easy to “game” measures of HRO and to have only a superficial appearance of action and progress merely by creating a new language by which current actions are labeled as being HRO compliant. The same pattern occurred during previous quality movements. The APSF Executive Committee will consider the suggestions and select a set of actions to move the HRO agenda forward. Dr. Gaba is Director of the Patient Safety Center of Inquiry at the VA Palo Alto Health Care System, Professor of Anesthesia at Stanford University School of Medicine, and Secretary of the APSF. Dr. Cooper is Associate Professor of Anesthesia at Harvard Medical School and Executive Vice President of the APSF. Gaba DM. Safety first: ensuring quality care in the intensely productive environment—the HRO model. APSF Newsletter 2003;18:1,3,4.